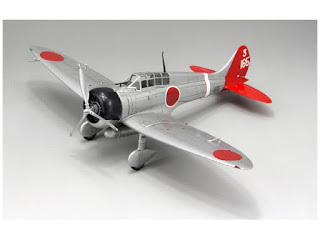 Following talk of forthcoming Fine Molds and Wingsy Mitsubishi Claude kits in 1/48 scale a hat tip to Aviation of Japan's Texas correspondent Mark Smith for highlighting the Sweet range of A5M4 kits in 1/144th scale with a review of the most recent to appear. 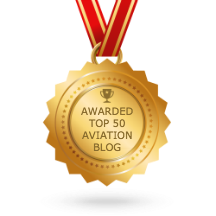 As they used to say - Have you got them all yet? "It had been too long since we had seen a new-tool aircraft in 1/144 from Sweet, but the recent appearance of their A5M4 Claude series has proven that this company remains unsurpassed for kits in this scale. 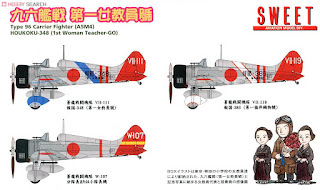 Following their usual ‘2 kits in a box’ format with decals by Cartograf, it debuted with a double kit for Chitose Fighter Group (below), which included some special markings I’d never noticed elsewhere. And in a particularly evil touch, one of the kits is molded in clear. It’s beautiful on the sprue but after trying to build one of their little Hurricanes molded in clear, I would leave it there! 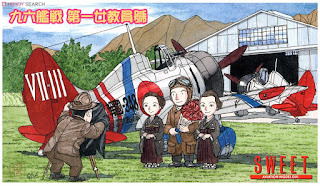 "This was followed by 'Sweet Decal' No.38 (one bagged kit only) 'Type 96 Carrier Fighter (A5M4) 12th Flying Group' featuring 3-107 flown by the famous IJN ace Saburo Sakai as a young pilot in China. 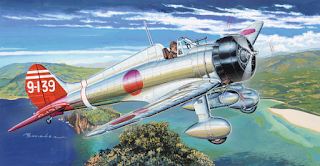 I sense it was a sentimental choice, and an appropriate one for many who read this blog and might have first became aware of the Claude via the photo of this machine in Sakai’s Samurai. 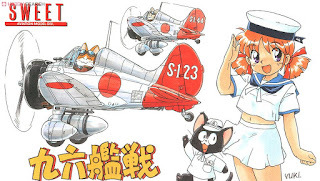 I was waiting, however, for the real clothes-horses flown by Soryu pilots in the days just prior to the Zero’s introduction, and with their two most recent releases, Sweet has not disappointed. 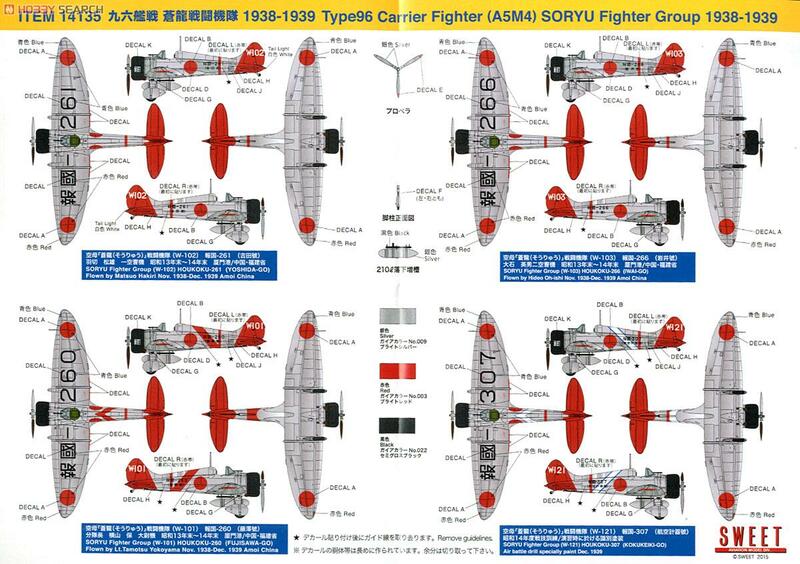 The kit for “Soryu Fighter Group 1938-39” offers markings for the iconic W-101, 102, and 103 trio piloted by Tamotsu Yokoyama, Matsuo Hakiri, and Hideo Oishi. But its other choice, W-121, may be the prettiest. 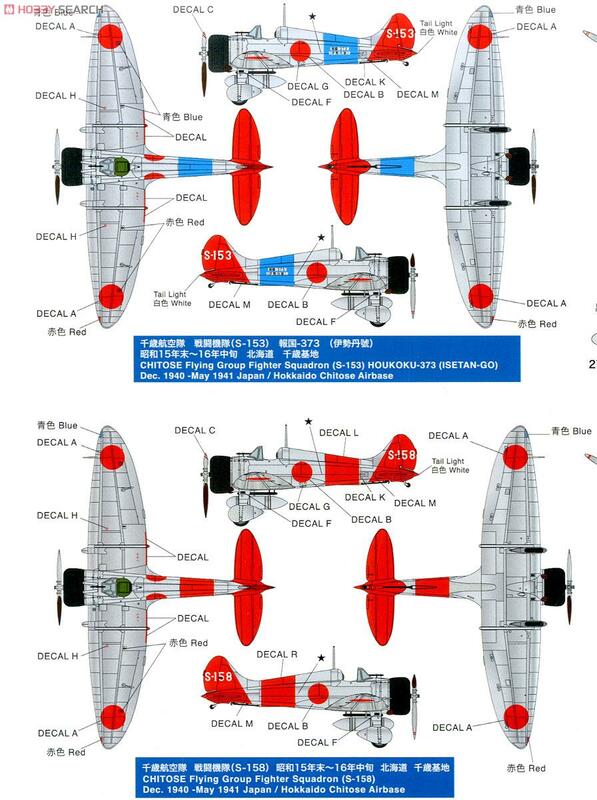 Sweet notes on the color marking guide that that latter is in ‘Air Battle Drill Specialty Paint.’ Having always assumed that the broad red, blue, and white diagonal stripes on these A5M4s denoted either a leader or a section/detachment within a larger unit, this comment makes me wonder if instead they might have indicated ‘teams’ taking part in the drill or exercise. 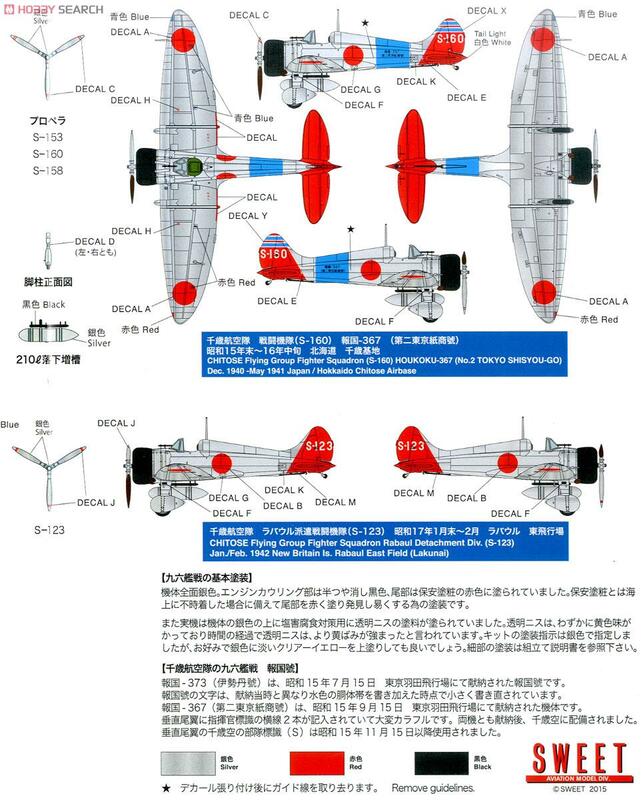 If anyone knows a bit more about these maneuvers and those who took part, the information would be appreciated. "And the boxing released in March, titled 'Houkoku-348 [1st Woman Teacher-GO]' (heading image) features probably the most colorful Claudes flown by the IJN, when a small detachment from Soryu was based at Kasonahara in early 1941. 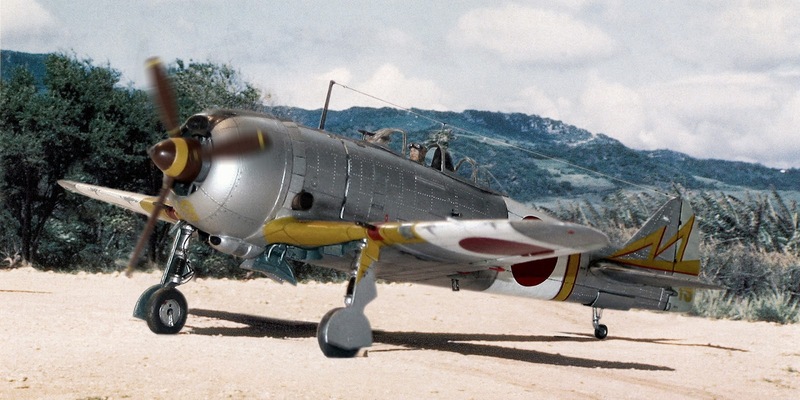 The presentation aircraft featured is VII-111 and was apparently donated either by or in honor of a school staffed by female faculty. 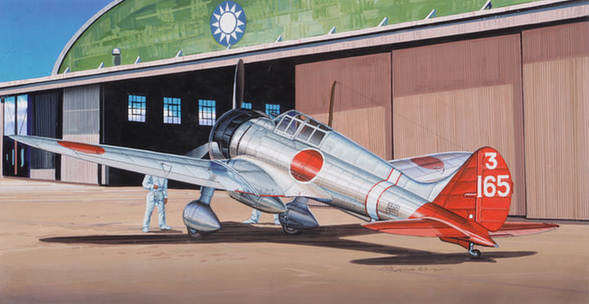 Another that rivals it for color is Houkoku-386 / VII-119, donated by Fukui Textile; its white sashes on fuselage and wings have in the past been illustrated with fine blue piping, but Sweet depicts them in red. 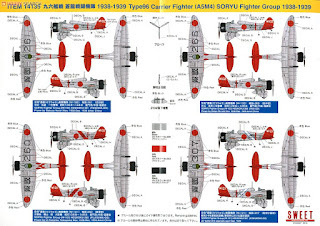 This boxing also includes markings for Group Leader (W-109) and Squadron Leader (W-107) birds from Soryu in late 1940. 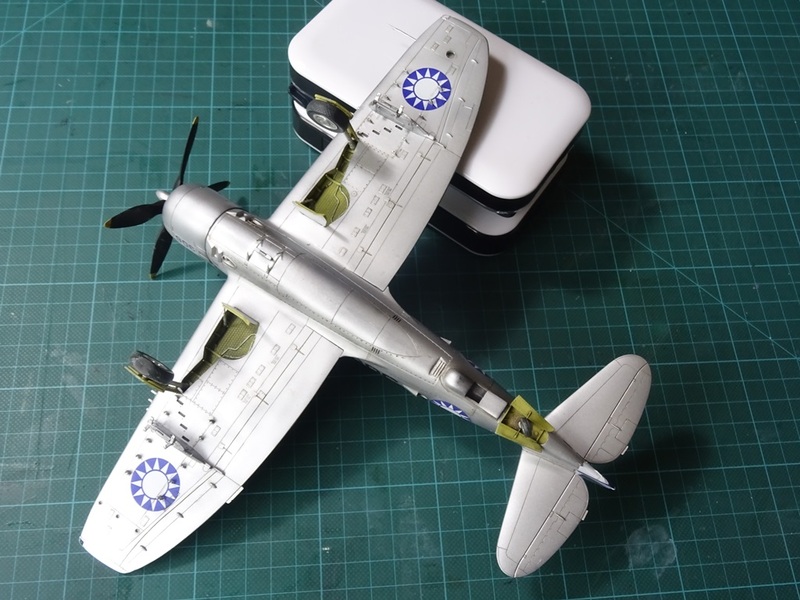 "As usual Sweet has done their homework, created a tiny masterpiece, and given the modeler and collector many choices of markings with superbly printed decals. While the art speaks for itself. The sprues are frankly too small for my camera to properly appreciate, but trust me, these moldings are simply exquisite and capture many subtle details in very few parts. And everything fits. Sure, they’re tiny, but wouldn’t you rather have two Godiva chocolate truffles than a king size Hershey Bar? Sweet." 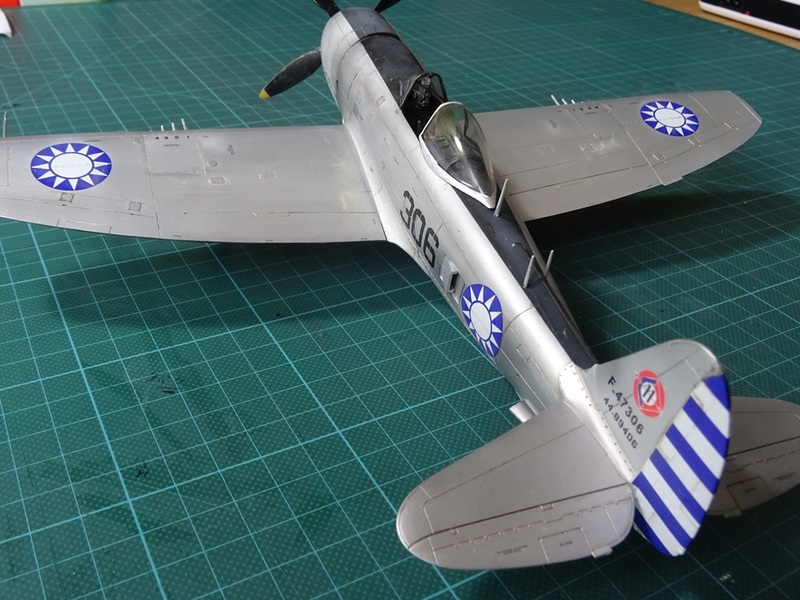 Special thanks to Mark for sharing his thoughts and images of the Sweet A5M4 kits. 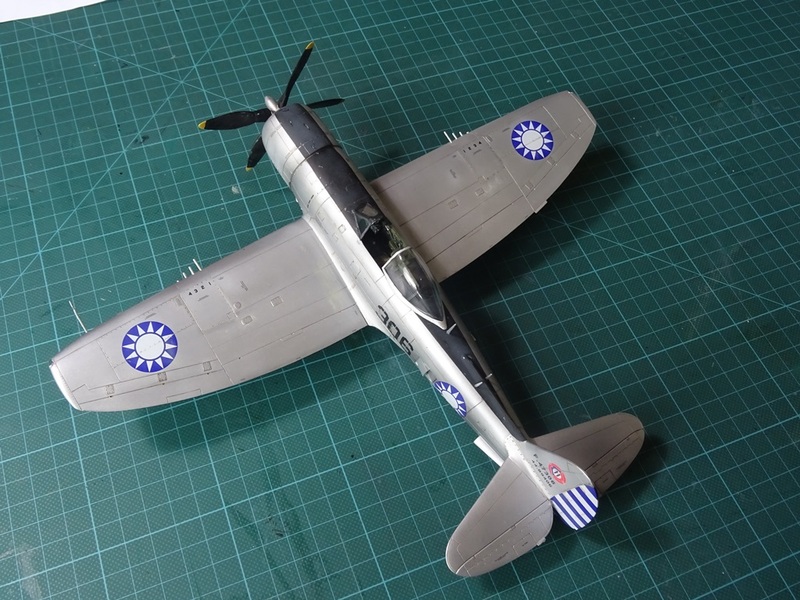 It is always a pleasure to display Chinese model aircraft subjects and Craig Godwin finished this sharp looking Academy 1/48th scale P-47N for a Britmodeller Group Build as a Republic of China Air Force (RoCAF) F-47N from the 11th BG based on Taiwan using Bestfong decals (Set 48043a). 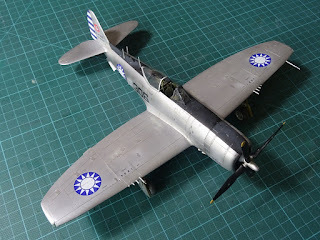 Craig's build report can be viewed here. It is perhaps a less well-known fact that the RoCAF F-47N was used extensively for bombing and reconnaissance missions over the Chinese mainland from 1950 to 1957 with 14 "Thunderbombers" lost to enemy action during air combat with the MiG-15 and La-11 or from anti-aircraft fire. 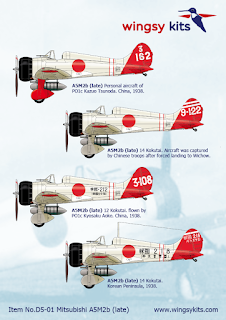 12 pilots were reported killed in action and two were reported missing in action from those sorties. The RoCAF P-47Ns equipped the 3rd, 8th, 26th, 27th, 41st and 43rd Squadrons and the squadrons of the 5th TFG. 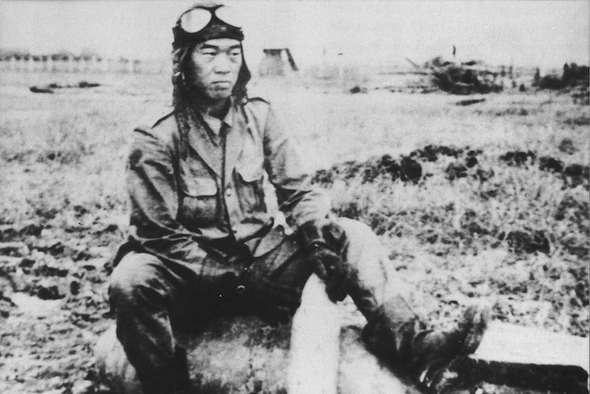 One P-47N pilot Lieutenant Hui Wei defected with his aircraft ('233') to the Peoples Republic of China on 18 May 1955, crash landing in Guangdong. 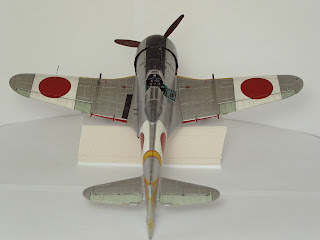 With special thanks to Craig for his kind permission to share these images of his excellent and unusual model here. You wait ages for one new 1/48th Claude to come along and then two arrive together! 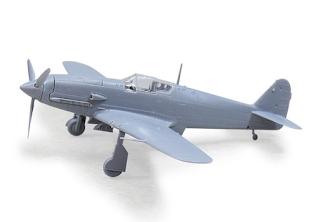 Hat tip to Vedran for alerting us to an announced A5M2b kit from Wingsy Kits. 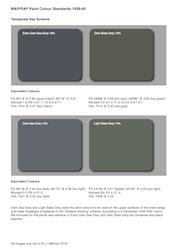 Due later this year but my heart sinks slightly at the prospects for re-inventions of the colour wheel. Image credits: Claude box art and profiles © 2016 Wingsy Kits; Hien box art and images © 2016 Aoshima Bunka Kyozai Co., Ltd. 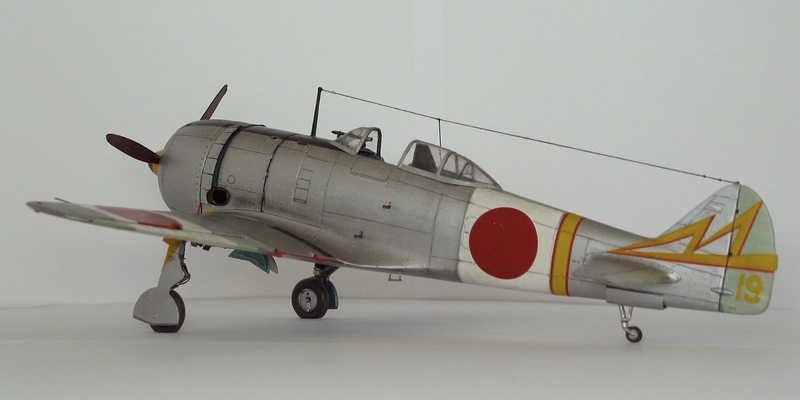 When Michael Thurow first sent me photos of his Ki-44-II Ko model in splendid 47th Hiko Sentai plumage I presumed at first it had been built from the Hasegawa 1/32nd kit. 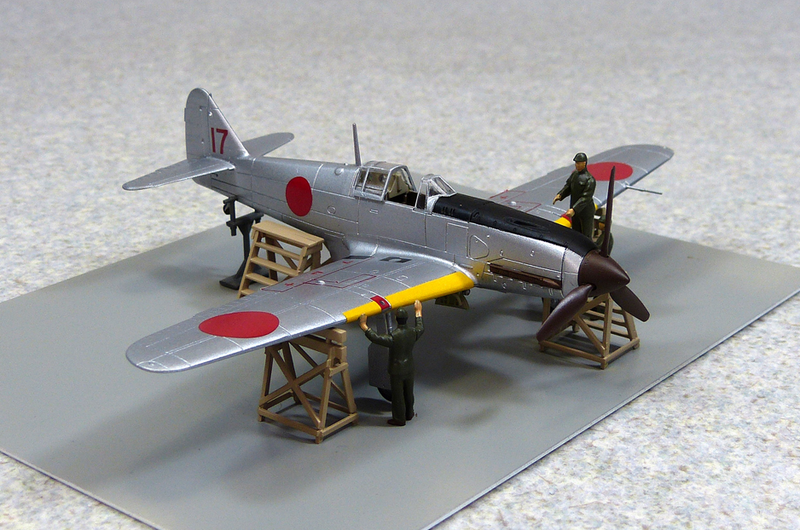 Then when it was clear that it was to 1/48th scale my presumption was still that it was Hasegawa's kit in that scale. 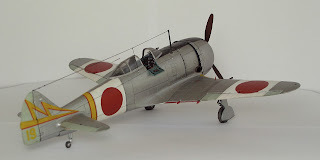 In fact Michael's beautiful model is made from the 1970s Otaki (now Arii) kit and it is a delight to share his build report here. I first built this Shoki in 1982 straight from the box. 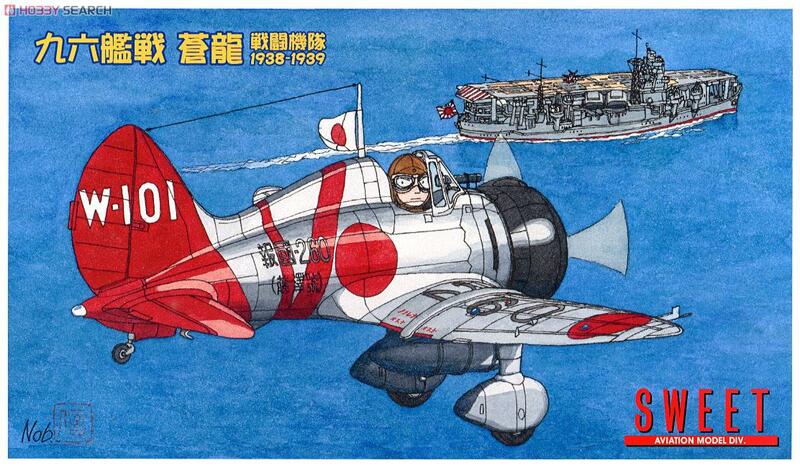 The Otaki kit was the only one available at that time. 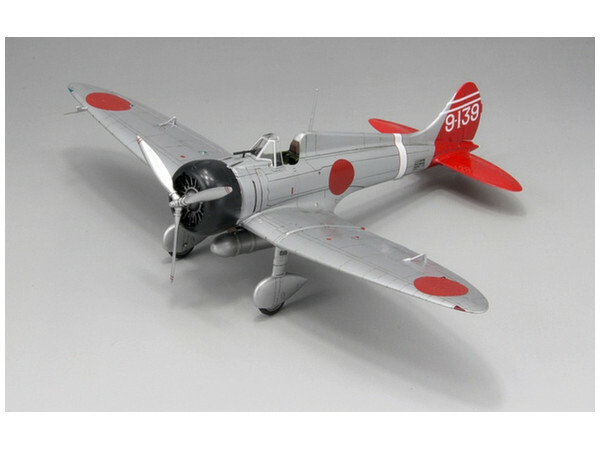 It is a simple, straightforward model with shape and dimensions that are generally correct, a very nice surface representation with engraved lines and rivets, and an excellent fit of parts. A few years ago I decided that it would need a considerable facelift to compete with my more recent models and I upgraded and re-finished it. 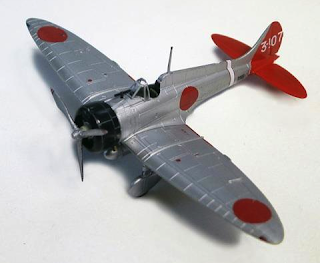 I didn't want to buy the latest Hasegawa kit to start over and actually I like refurbishing my vintage models. Besides the nostalgia I consider it somewhat easier because all the weaknesses from the previous build can be seen. 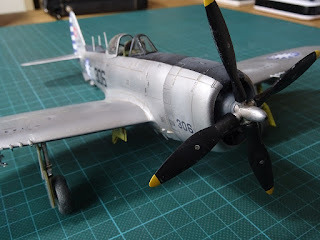 To begin with I scraped away the interior of the cowling front to widen it because as provided in the kit it is a little too small in diameter. 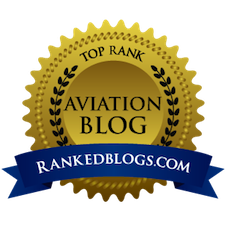 I deepened the upper air intake, enlongated the oil cooler beneath the cowling and made its scoop more oval in shape. 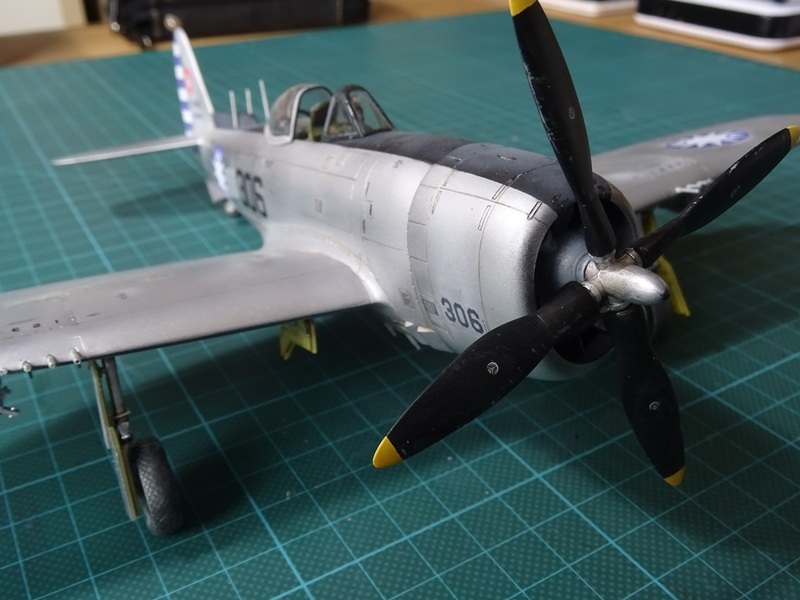 Then I drilled locations for the replacement exhausts and fabricated new cowling flaps. 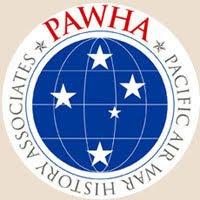 For cowling flaps I usually cut pieces from thin smooth cardboard then to produce their slightly rounded profile I roll back and forth over them with a narrow metal tube until they start to bend. 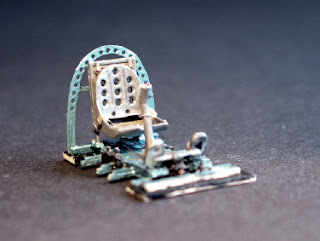 After applying a thin, overall layer of plastic glue they can even be sanded and have a nice even surface for painting. I completed and inserted the Jaguar cockpit interior set as shown above, then cut open the starboard cockpit access door and drilled holes in front of the wind screen to replicate the small air vents for the cowling machine guns. 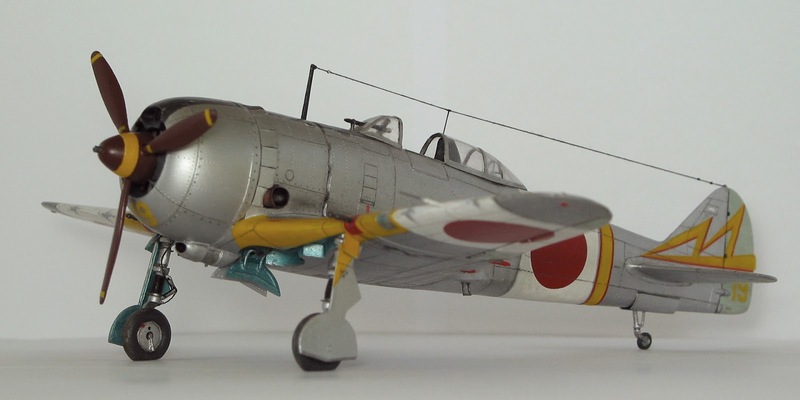 Since this is a Ki-44-II Ko version with 7.7 mm Type 89 fuselage guns the rear gills needed to be cut smaller from the ones that came with the Eduard set for the 12.7 mm guns of the Otsu. Next I replaced the ailerons and rudder with the Jaguar items but did not replace the elevators because intended for the Hasegawa kit the Jaguar parts did not fit properly. 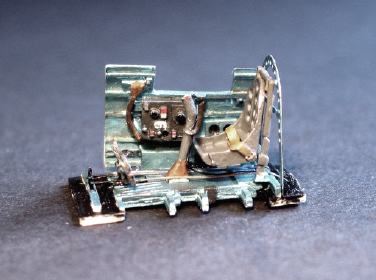 Note that the inserted elevator trim tabs were separate movable aluminium parts and not doped the grey-green colour. 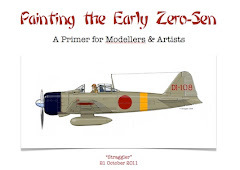 I realised this only after my model was finished. The wheel wells don't look like the original and had to be modified. 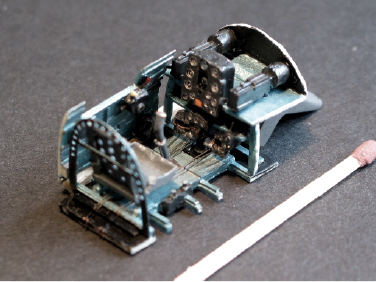 The inner surface should have a curved profile with weight reduction and access holes while the kit provides a flat housing with imitated stringers. Most difficult was the creation from scratch of the small undercarriage retraction links that protude from under the wings since the Otaki kit does not represent those. 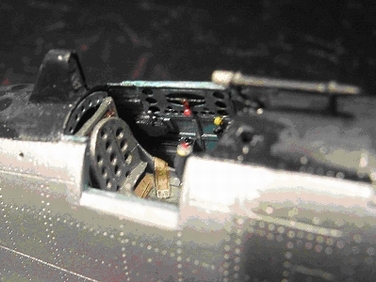 The tail wheel opening had to be enlarged and new doors were fabricated. This time I cut the door pieces from the sprue of an etched metal set and used the rolling method described above for rounding their profiles. Other small improvements included new 12.7 mm Ho-103 wing gun barrels, installing the leading edge landing light, and adding cockpit entry steps and landing flap rails. As can be seen my model represents a home defence fighter from the 3rd (Sakura) Chutai of the 47th Hiko Sentai. 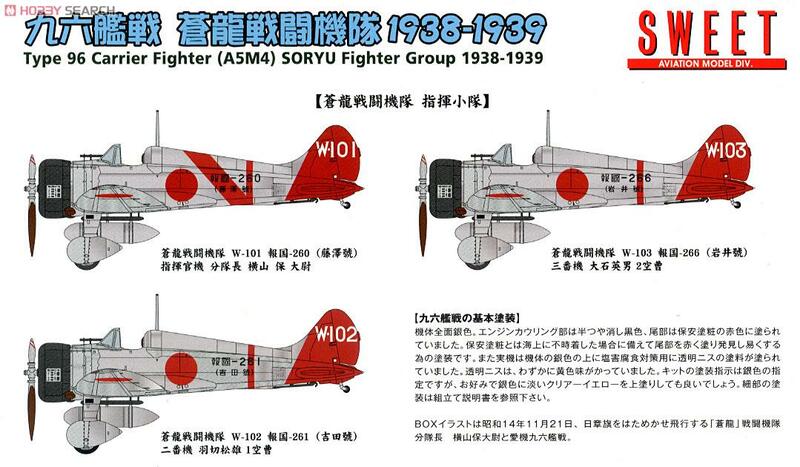 My original 1982 model displayed the same markings but with black instead of red border to the fuselage band and tail insignia. This time I made more effort to approximate the decals to the original symbol shape as far as possible and in what I now thought were the correct colours. 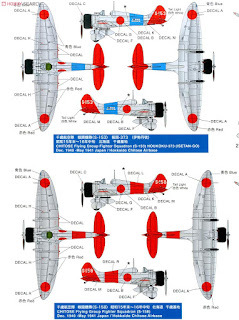 The photograph above and subsequent colour illustrations were reproduced many times in the last four decades interpreting aircraft #19 as belonging to the 3rd Chutai with yellow squadron markings. More recent research suggests that these aircraft belonged to either the 1st (Asahi) or 2nd (Fuji) Chutai and that the colour might have been blue with a black outline. Seventy-three years after some dilligent servicemen completed this nice paint job and with only b&w photos available it may be difficult to resolve the question of colour with any certainty. 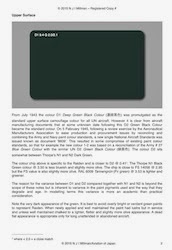 As long as there is some doubt about which Chutai #19 belonged to I would not take the risk of changing the colour again - for now I like my Shoki the way it is! With special thanks to Michael for sharing these photographs and build report of his model with Aviation of Japan. 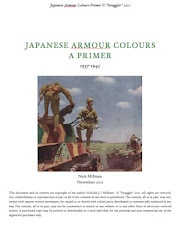 In his seminal partwork series from 1977 to 1979 in the Japanese Koku Fan magazine Minoru Akimoto gave the Chutai colour sequence for the 47th as 1st blue, 2nd red and 3rd yellow. 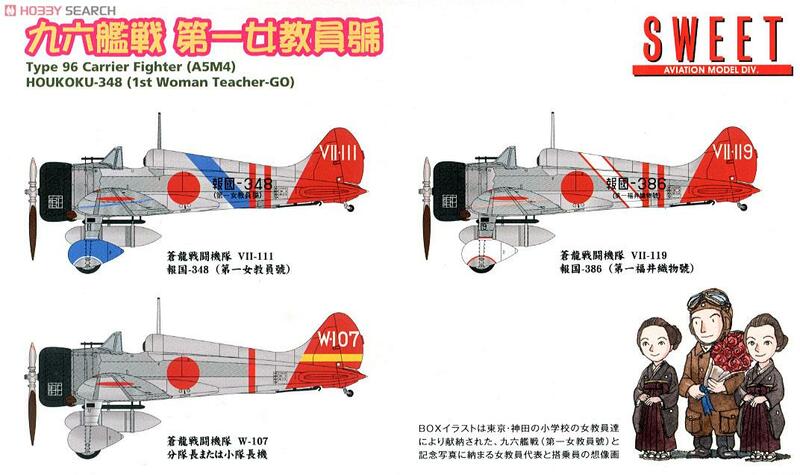 That corresponded with the table in the 1972 Bunrin-do book 'The Japanese Army Wings of the Second World War'. 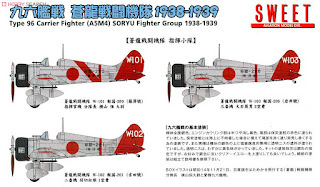 Some doubt about this sequence was introduced by the authors of the 2009 Model Art monograph on the Ki-44 (Model Art # 779) who captioned a photograph of 1st Chutai fighters as having tail insignia in red or blue and further stated that Sentai Hombu (HQ) Shotai (flight) displayed white insignia outlined in blue. According to this account the 1st and 2nd Chutai tail insignia were outlined in black with the 3rd Chutai insignia outlined in red. The decision to show the 1st Chutai colour as red and the 2nd Chutai colour as blue in 'Ki-44 Aces' was based on photographs showing the aircraft of the 1st Chutai leader Captain Jun Shimizu and the 2nd Chutai leader Captain Yasuro Mazaki. The former revealed a fuselage band and tail insignia as dark as the Hinomaru and the latter tail insignia, a fuselage band and a painted spinner appearing significantly lighter than the Hinomaru but darker than the yellow leading edge IFF strips, all of which taken together appeared to contradict the colour convention! 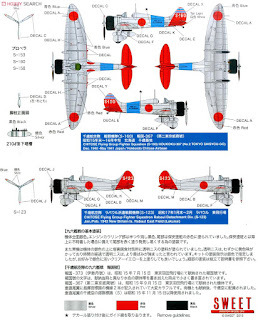 In the 2015 Shinkigensha book 'Imperial Japanese Army Air Service Illustrated (Fighters Edition)', which lists 'Ki-44 Aces' as a reference, Yukinobu Nishikawa illustrates aircraft # 19, the subject of Michael's model, with blue tail insignia and fuselage band edged black and identifies it as a 1st Chutai aircraft! 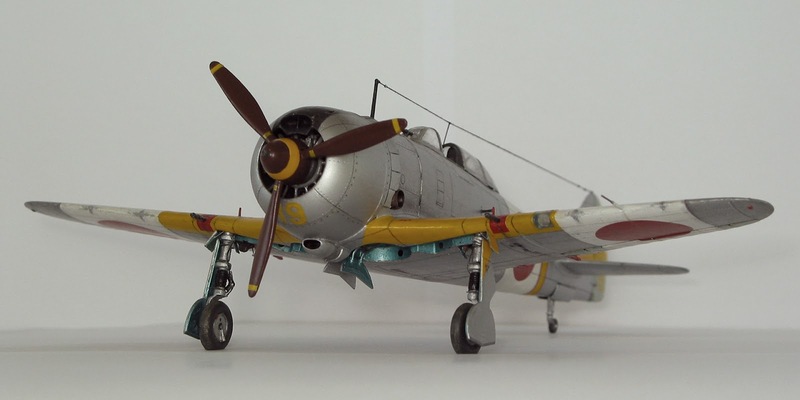 Tonal interpretation is by no means definitive so there is room for doubt and convention often trumps revision, as in the case of two famous aces of the 70th Sentai, whose Shoki in model form almost invariably display yellow tail insignia that shoud be red! New Fine Molds 1/48th A5M Kits! Fine Molds are due to release all new tool kits of the Mitsubishi A5M "Claude" fighter in 1/48th scale. From the box art so far seen these appear to be Kit # FNMFB-21 A5M4 and FNMFB-20 A5M2. 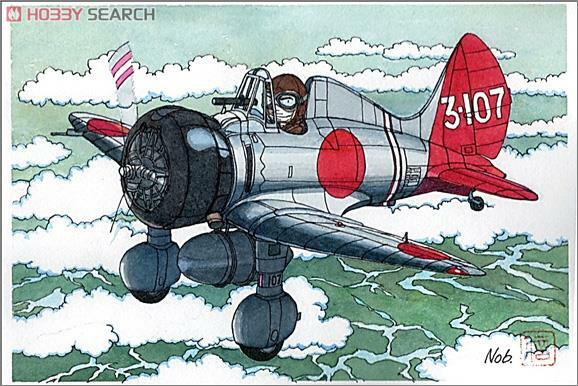 The enclosed canopy Claude was designated Model 2-2 but was not popular with pilots, was often flown with the canopy removed and rarely seems to have been photographed. 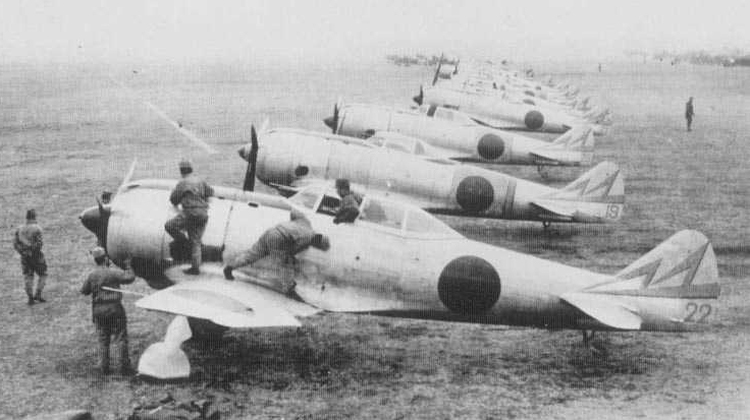 The Nagoya factory made 108 with a further 16 produced by 21st Naval Aircraft Arsenal after Nagoya production had ceased. 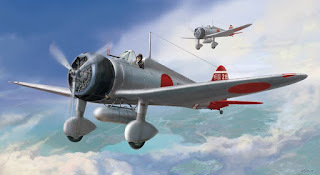 Announced for release in July this year both kits are expected to cost approximately £18 (US$ 25) each direct from Japan and should prove popular!